Nicki Chen was born in Washington State, USA, in 1943. While studying at Seattle University, she met her future husband, a Chinese engineer. They lived for a time in her hometown, but then his job took them to the Philippines. They didn't return to live in the United States for another twenty-two years. While an expat, Nicki earned an MFA in Creative writing from Vermont College of Fine Arts, a feat that required nearly round-the-world travel twice every year. Beyond writing, Nicki is an accomplished Chinese brush painter and a batik artist. Why did you set Tiger Tail Soup in Xiamen, China? And why during World War II? My late husband was a natural storyteller. From the time we started dating, he entertained me with tales of his childhood in China, Taiwan, and Japan. My favourite stories were the ones about his earliest years in Xiamen during World War II. In 1983, after several years of marriage, my husband and I had an opportunity to visit Xiamen and Gulangyu with our three teenage daughters. On that trip I saw for myself the house where he was born and the island that one day would be the setting for my novel. By the time I started writing, my husband’s childhood had become as real to me as my own, and twice as interesting. What are the themes and the premise of the story? Theme: A strong woman can suffer the horrors of war, the loss of loved ones, and the extended absence of a spouse without losing hope. Premise: Left alone when her husband joins the military, a young Chinese woman struggles to keep her family alive when the Japanese invade and occupy her city. Why the title Tiger Tail Soup? During World War Two there were still thousands of tigers in Fujian Province. In fact, the Amoy tiger from Fujian is thought to be the ancestor of all the world’s tigers. In one of my husband’s tales about his childhood, two tigers swam across to Xiamen from the mainland. The first was killed by a farmer; the second by a Japanese soldier. The Japanese ate the tigers and sold the leftovers to the Chinese. Under occupation, people were malnourished and starving. My husband’s family bought a length of tail and made it into a soup. To me, that soup was a symbol of the will to survive. Writing is my main occupation. I write on most weekdays. Even though I spend less than forty hours a week writing, I do consider myself a full time writer. What led you to choose self-publishing, as opposed to taking the traditional publishing route? I tried the traditional route, but after having a bad experience with an agent and then putting my novel aside for a while, my daughter encouraged me to self-publish. Any advice you can give to authors thinking about taking the indie route to publication? Hiring a good editor and researching the various options available for self-publishing are the obvious and necessary first steps. Opportunities are changing every day, so ask advice of people whose experience is current. Being new to the game, I chose Dog Ear Publishing, a company that provided lots of support. It was expensive, but for me it was worth it. Before publication, you should research and prepare for your marketing campaign. Build up your brand through social media. Get out there on Facebook and Twitter. Consider starting a blog. Find pre-publication reviewers. Prepare for a blog tour and a book launch party. A year before publication, I started a blog, Nicki Chen Writes. I post something new every Sunday, sometimes more often. My blog is geared toward my readers, that is, anyone who might be interested in the subject of my novel. I also reach out to readers on Facebook, Google+, Pinterest, Goodreads, and my Amazon author page. One of my favourite ways to connect is by attending book club meetings. I’ve had some excellent reviews of Tiger Tail Soup from men, but the majority of my readers are women of all ages. World War II affected the whole world. 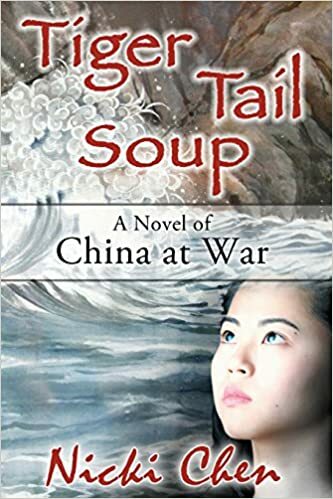 It’s a huge subject, but China’s part in that war has been underrepresented in Western literature. People who want to expand their understanding of World War II as well as those interested in learning about another culture are part of my target readership. My novel is also of interest to anyone who likes family stories, love stories, and stories of strong women challenged by world events. I try to do some marketing every week, and whenever an opportunity presents itself, I grab it. The friends and readers I’ve made online help spread the word, but meeting people face to face is even better. I always carry my business cards and give them away whenever possible. The novel I’m working on now is set in Manila and the South Pacific island nation of Vanuatu. It features an American expat woman who quit her job and followed her husband abroad with the expectation that they would start a family. It’s been two years now, and she’s still not pregnant. Something has to change. What are your plans for developing your career as an indie author? My focus right now is on writing my as-yet-unnamed novel. When it’s finished, I’ll decide the best method for sending it out into the world.